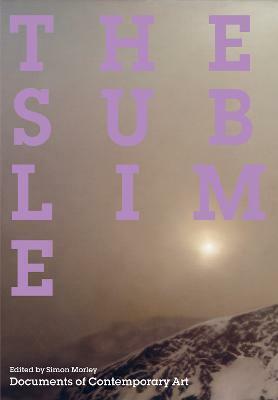 In the contemporary world, where technology, spectacle, and excess seem to eclipse nature, the individual, and society, what might be the characteristics of a contemporary sublime? If there is any consensus, it is in the idea that the sublime represents a testing of limits to the point at which fixities begin to fragment. This anthology examines how contemporary artists and theorists explore ideas of the sublime, in relation to the unpresentable, transcendence, terror, nature, technology, the uncanny, and altered states. Providing a philosophical and cultural context for discourse around the sublime in recent art, the book surveys the diverse and sometimes conflicting interpretations of the term as it has evolved from the writings of Longinus, Burke, and Kant to present-day writers and artists. The sublime underlies the nobility of Classicism, the awe of Romantic nature, and the terror of the Gothic. In the last half-century, the sublime has haunted postwar abstraction, returned from the repression of theoretical formalism, and has become a key term in critical discussions of human otherness and posthuman realms of nature and technology.Artists surveyed include Marina Abramovic[accent over c], Joseph Beuys, Tacita Dean, Walter De Maria, A K [the artist excludes periods after the initials] Dolven, Olafur Eliasson, Andreas Gursky, Jitka Hanzlova, Gary Hill, Susan Hiller, Shirazeh Houshiary, Anish Kapoor, Mike Kelley, Anselm Kiefer, Yves Klein, Richard Long, Barnett Newman, Tony Oursler, Cornelia Parker, Gerhard Richter, Doris Salcedo, Lorna Simpson, Hiroshi Sugimoto, Fred Tomaselli, James Turrell, Luc Tuymans, Bill Viola, Zhang HuanWriters include Marco Belpoliti, John Berger, Paul Crowther, Jacques Derrida, Okwui Enwezor, Jean Fisher, Barbara Claire Freeman, Jeremy Gilbert-Rolfe, Doreet LeVitte-Harten, Eleanor Hartney, Lynn M.
Simon Morley is a British artist and art historian who has contributed to international art journals including Art Monthly, Untitled, Contemporary Visual Art, Tate Etc. and Tema Celeste. A Lecturer in Painting at Winchester School of Art, England, he is the author of Writing on the Wall: Word and Image in Modern Art (2003).